Are you sick and tired of mosquitoes? We can help by providing you with a seasonal spray plan, party spray and simple yard maintenance. Please give us a call at 207-337-2773 or e-mail us at pomticks@maine.rr.com for more information. Each summer, hordes of these insects descend on backyards, parks and campgrounds. Peace of Mind Tick Control Inc. can help! We provide the relief you are looking for in the form of a Mosquito Spray, organic or conventional. We are able to keep your area enjoyable for the season or we also can provide a Party Spray for an event you may be having like Outdoor Weddings, Parties, or gatherings. Mosquitoes locate bloodhosts by scent, sight and heat. From 100 feet away (30 meters) mosquitoes can smell your scent, especially the carbon dioxide (CO2) you exhale. Biting flies are even better; they can smell their animals and humans from 300 feet (100 meters) away. Because CO2 is present in the atmosphere (plants take in CO2 and give off oxygen), mosquitoes respond to higher-than-normal concentrations, especially when the CO2 is mixed with host-odor. They follow your scent upwind, and can see you at a distance of about 30 feet (10 meters). Mosquitoes do not feed on blood. 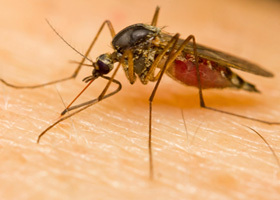 The female mosquito requires a blood meal for development of her eggs. Both males and females obtain some nutrition from flower nectar, but it is only the females that feed on blood to acquire the extra protein boost needed to produce and lay eggs. In this process the females can also carry disease organisms and parasites from one host to another and thus may serve as vectors of diseases such as malaria, yellow fever, and various forms of viral encephalitis. In the past these diseases have not been considered a problem in Maine. 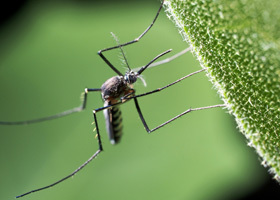 Recently, however, concern has been expressed regarding the increased incidence in the Northeast of arboviruses (arthropod-borne viruses) such as Eastern Equine Encephalitis (EEE) and more recently the introduction into the eastern U.S. of another form of encephalitis known as the West Nile Virus (WNV). As a result of increasing concerns, a monitoring protocol has been developed for Maine mosquito species which may serve as vectors. Heartworm, a disease of canine pets caused by filarial worms, is also transmitted by mosquitoes and is now established throughout most of New England.